1 Theory: Junqueira L.C. and Carneiro J. (2004, 10 th ed.). Functionele histologie [Functional Histology], Maarssen. Elsevier. Chapter 1, Waarnemingsmethoden [Observation techniques], pp. 16-22. - Bright-field microscope: by far the most widely used and further discussed below. - Phase contrast microscope: unstained specimens normally show no contrast and will not provide a usable image viewed through an optical microscope. Phase contrast microscopy was invented by Frits Zernike (awarded the Nobel Prize in 1953) and is based on using the small phase shifts created by the tiny refraction differences in the specimen which are depicted as changes in amplitude, that is as degrees of brightness (light/dark). Phase-contrast microscopy is used for unstained specimens, such as newly isolated cells or cultivated living cells, or otherwise untreated tissue samples prepared using cryofixation. Stained specimens will not provide a good image with a phase-contrast microscope. - Polarized light microscope: tissue components with a periodic or repetitive structure of atoms, molecules or supramolecular components are able to displace polarized light rays, so that the light between a pair of crossed polarizing filters will no longer be extinguished. The first polarizing filter, called the polarizer, is installed under the condenser, and the second between the objective and the eyepiece, which is known as the analyzer. - Fluorescence microscope: fluorescent materials convert light with a short wavelength, such as blue (excitation), into light with a longer wavelength, such as green or red (emission). In a fluorescence microscope, the light beam first passes through the excitation filter, which limits the excitation light to a certain wavelength, while the emission light emitted by the specimen is passed through an emission filter, which filters out the rest of the excitation light from the beam. Fluorescent parts of the specimen light up against a dark background, which means that a weak signal or structure smaller than 0.25µm is often still visible. Fluorescence microscopy is often used with distinctive lighting (epifluorescence), where the excitation and emission light beam are separated from each other by a beam splitter, also known as a dichroic filter/mirror. Most specimens are viewed through an optical microscope (light microscope) using transmitted white light; this is thus also known as bright-field microscopy. 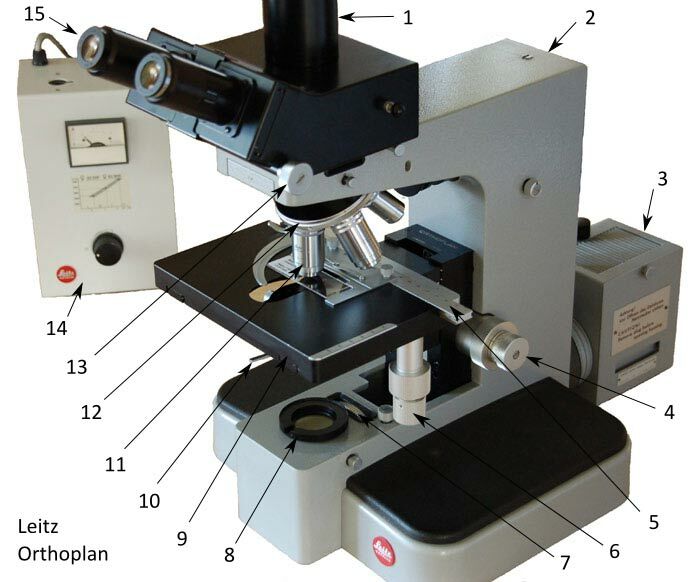 An optical microscope (depicted below is the Orthoplan model made by Leitz) has optical and mechanical components. The optical system comprises three lens systems: the condenser, the objective and the ocular lenses (eyepieces). The condenser concentrates the transmitted light on the specimen. Together with the objective, this lighting determines the brightness, the resolution and the quality of the image¹. The condenser is fitted under the object stage. 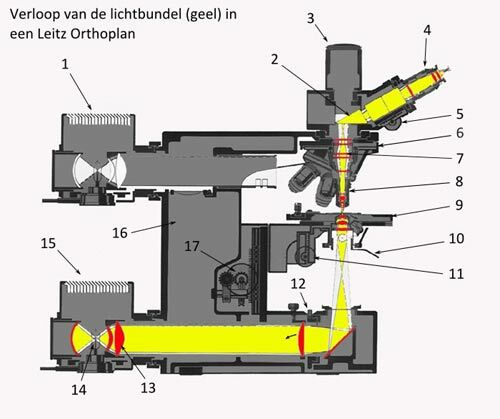 Illustration of a Leitz Orthoplan showing the optical path of a light beam in yellow and the most important components. A light source produces white light which is directed via a mirror in the condenser, the latter comprising a number of lenses. The light is focused on the sample by the condenser. The objective has a short working distance (sometimes extremely short) to the sample, creating a magnified image of the specimen, which is further enlarged by the eyepiece and projected on the retina. The prism serves to deflect the light, so anyone using the microscope can seat themselves comfortably¹. A microscope’s resolution is defined as the smallest distance where two points are still portrayed as separate. The resolution depends in particular on the objective, to a lesser extent on the condenser, while the eyepiece contributes the least. The image quality is determined by the colour depiction, the transparency, the contrast and the resolution of the lenses, and the sample’s characteristics also play a major role. Good image information is the result of a good balance between magnification and resolution. When higher magnification is not combined with higher resolution, the magnification is pointless. The numerical aperture (NA) of the objective is an extremely important specification: the higher the NA, the higher the resolution, but also the shorter the working distance to the specimen. Good objectives have a high NA and are always expensive as a result. The Objectives page describes various Leitz objectives in detail. Theory and practice taught August Köhler (1866-1948) how to adjust a microscope to create the best possible images, and this became known as Köhler illumination. This optimum adjustment is not only the best for the microscope mentioned earlier, but essentially for any microscope. The adjustment procedure can be practised in a virtual setting on the interactive website (http://www.microscopyu.com/tutorials/java/kohler/) or by clicking on the illustration below. 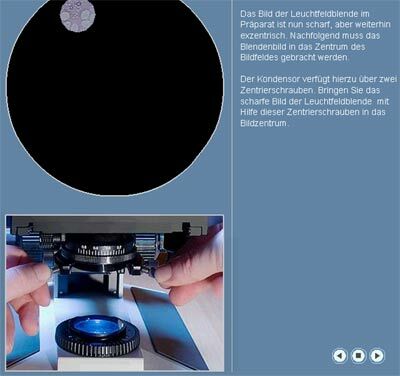 This German website created by Christian Linkenheld has a good animation of how to adjust a microscope according to Köhler. Click on the illustration to go to Christian’s website and view the animation. a. Seat yourself behind the microscope in a comfortable position and with back held straight. b. Adjust the light (Fig. 1, no. 14) to a moderate level. Open the field diaphragm (Fig. 1, no. 12). c. Using the vertical condenser adjustment (Fig. 1, no 11), set the condenser as high as possible without it touching the specimen at all. d. Open the condenser diaphragm (Fig. 1, no. 10) completely. e. Place the specimen on the object stage (Fig. 1, no. 9) and bring it into focus at low magnification (objective 10x), first with the coarse focus adjustment and then with the fine adjustment (Fig. 1, no. 17). f. Adjust the eyepiece (Fig. 1, no. 4) to suit the distance between your eyes, using the knob in question (Fig. 1, no. 5). g. Close the field diaphragm (Fig.1, no. 12) and adjust the height of the condenser with the knob (Fig.1, no. 11) in such a manner that in doing so you see the grooved edge of the field diaphragm come into sharp focus. h. Centre the projection of the field diaphragm using the condenser adjustment knobs (Fig. 2 no. 2). i. Open the field diaphragm (Fig. 1, no. 12) far enough so that it can just be distinguished on the edge of the field of view. j. Close the condenser diaphragm (Fig. 1, no. 10 and Fig. 2, no. 3) to the position suited to the objective. At low magnifications the optimum position will be slightly more closed than at higher magnifications. The microscope is now ideally adjusted for a 10x objective. k. To use higher magnifications (40x objective or 100x objective), steps d-j must be repeated with the exception of step f. (NB: when using the 100x objective always set the condenser as high as possible because the projection of the field diaphragm will not be easily visible). Any trouble taken to prepare good specimens is pointless if there is not a good microscope to inspect them with. Although there is no easy answer to what precisely comprises a good microscope, the following always holds true: ‘A good microscope does not come cheap’. Below are a few matters that can be taken into consideration when choosing a microscope. Monocular, binocular or trinocular (1, 2 or 3 oculars)? With a monocular, one eye is used to look through the microscope. After half an hour this becomes tiring and it is no longer possible to view things at ease. A binocular is much more comfortable to use, and because viewing is more relaxed, more details can be discerned. A trinocular has an extra tube fitted that can be used to attach a photo or video camera. At some point the desire to photograph microscopic images will usually arise. Although not 100% necessary, a mechanical stage is almost indispensable. Without one, the specimen will need to be moved by hand in order to look ‘through’ the specimen, which is practically impossible at higher magnifications and when using oil immersion objectives. Condenser, diaphragm and filter holder! The better microscopes will all have this feature. It is a special lens that transforms the light from a source, which is roughly in the focal point of the lens, into a more or less parallel, evenly distributed beam. The condenser has a diaphragm to regulate the amount of light and usually one or more filter holders for use with coloured light or polarization filters. A good microscope is solidly built. The foot and frame are sturdy and therefore heavy. This diaphragm is necessary to achieve proper adjustment according to Köhler. Nearly all older microscopes have adjustable halogen lighting. Halogen lighting that is indeed easily adjustable is perfectly fine. LED lighting put in an appearance in recent years and is quickly gaining in popularity. Until about 2011, only blue/white light LEDs were available, while now the entire range between warm white and cool white is on the market. Because more short wavelengths are available than before, more details can be discerned in specimens than previously. In addition, LED has other advantages compared to halogen lighting, in particular the lower wattage and the low heat emission, which means that specimens do not heat up and dehydrate, and that any organisms under the microscope move less and so on. The microscope itself also no longer grows warm; as a result the heat turbulence in the light beam is so much lower that when maintenance takes place the fact that LED is being used is easily recognized since there is so much less dust and residue. There are disadvantages too, however. The image produced using LED is whiter than with halogen and will take some getting used to. LED lighting itself of course has disadvantages too, forming a challenge to designers, which particularly comes into play at higher wattages. An LED used to replace a 100 Watt lamp can become extremely hot and would quickly become defective without an out-sized cooling element (usually a block of aluminium with fins). Although the LED lamp itself can grow hot, the heat emission in the light itself is entirely negligible. The regulation needs to be high-calibre as well, due to the electrical characteristic of LED that it can only be regulated by current (halogen by voltage). Since this is all somewhat more complex, it is more expensive than halogen. It is advisable to test matters at a reputable dealer. A good objective is expensive, and an excellent objective unfortunately is very expensive! An anonymous objective made somewhere in the Far East isn’t necessarily low-quality, but an objective made by a renowned brand using perfect types of glass, corrected in all possible fields and with a high numerical aperture will simply provide a wonderful field of view. For bright-field microscopes there are three sorts of objectives: achromatic, fluotars and apochromats. In addition, objectives can be corrected for spherical aberration (sharp until the visible field). The 'Objectives page' has a lot of useful information about Leitz objectives. There are many renowned brands: Zeiss, Leica, Leitz, Olympus, Lomo, Hund and Nikon (Leitz microscopes can no longer be bought new. Leitz has been taken over by Leica). Many other brands such as Novex are Chinese. There are few or no accessories available for such microscopes. The renowned makes are always expensive, while Chinese imports can be much cheaper. The latter are fine when taking up microscopy as a hobby, but later a microscope made by a well-known brand will be wanted. A new microscope with high-quality objectives made by a renowned brand is very expensive (between €10,000 and €50,000). There are many very good microscopes available second-hand. The 'Linkpage' lists a number of dealers. Auction sites like eBay will also sometimes have very good microscopes for sale. 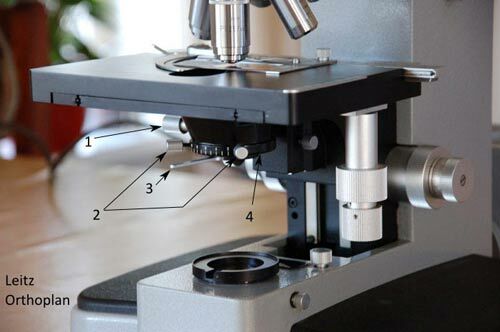 The differences between expensive research microscopes and cheap student microscopes have to do with the accessories and the quality of the components. A mechanical stage and built-in lighting make a microscope more expensive. A solid design, good optics with objectives that have been corrected for all sorts of optical errors (chromatic and spherical aberration, flat image fields), and also the size of the field of view (how much do you actually see using 800x magnification) make high-quality microscopes very expensive. It is much better to purchase a good used microscope than a cheap new one. Toy microscopes costing a few dozen euros are almost always very bad: the money would be much better spent purchasing a good magnifying glass with two or three elements for magnifying 10x-20x.